HP has recently announced its nine digital cameras, two Photosmart printers and an all-in-one Photosmart printer which are Mz67, M447, M547, M637, M737, R937, R847, R742, E337, D7260, D7460 and C5280, with the most attraction being the HP Photosmart R937, a small, sleek, light-weight and stylish 8 megapixel compact digital camera that features an incredible 3.6 inch touchscreen LCD display and Fujinon 3x optical zoom lens. With its touchscreen function, you can even add email addresses and tags to photos by your finger touch on its virtual keyboard. The company has added the latest HP Design Gallery features such as industry-leading in-camera red-eye removal, pet-eye fix, slimming, HP steady photo anti-shake and HP touch-up into HP Photosmart R937, aimed to enhance your photography experience. 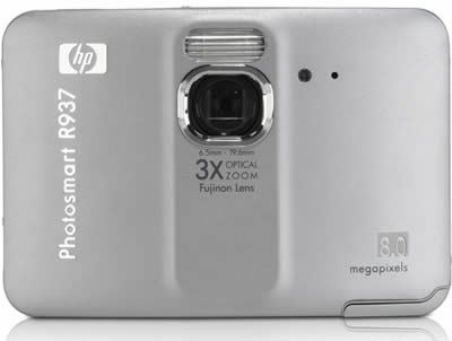 The HP Photosmart R937 digital camera will hit the market in coming August for about $300.